One of the most powerful storms on record to make landfall, struck the eastern coastal provinces of Leyte and Samar on Friday, November 8th. It then headed west, sweeping through six central Philippine islands. 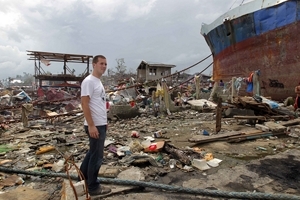 More than three weeks later, the official death toll from Typhoon Haiyan stands at just over 5,000 people. There are another 1,000 people still unaccounted for. 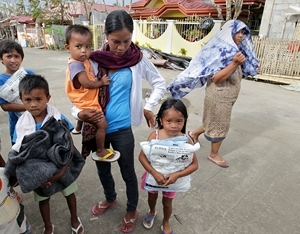 The disaster has still affected more than 13 million people; in excess of four million people have been left homeless. The aid agency, GOAL is on the ground in The Philippines, responding to the crisis and Purchase.ie has picked Goal as their Christmas charity for 2013. When ordering online from Purchase.ie submit either of the below codes at checkout. Use Goalgive and purchase.ie will donate 10% of the sale to the Goal. Use Goalsave and you will receive a 5% discount on your order and purchase.ie will donate another 5% of the sale to Goal. Alternatively call us on 01 8428187 quoting either code and we will process the order for you over the phone. week. Her story is typical of those caught up in the storm. Marissa has six children, all of whom are between two and 11 years-old. When the typhoon hit, it ripped the roof off their one-room house sending the family running outside. Soon afterwards, as they huddled with a neighbour, a large tree fell on their home and destroyed it. Because of the number of damaged and demolished buildings in Jaro, GOAL has been delivering emergency shelter kits, which include tarpaulins to protect families from the incessant rain; kitchen sets and jerry cans for carrying water. Hygiene kits and blankets will arrive next week. They have already reached more than 20,000 people with aid across two islands, and will distribute emergency shelter kits to 32,000 people over the next two weeks. However, they can reach even more people with your support. If you would like to donate directly to GOAL’s response to Typhoon Haiyan, please visit www.goal.ie, telephone GOAL on 01 280 9779, or follow GOALIreland on Facebook.